Leccy Tech The single lap TTxGP race for leccy bikes that took place as part of the Isle of Man TT battle back in June has proven to be the snowball before the avalanche. According to TTxGP promoter Azhar Hussain, plans are underway to create a five-race International World Championship (IWC) for e-bikes, a four-race British e-bike championship and a three-race series in North America. 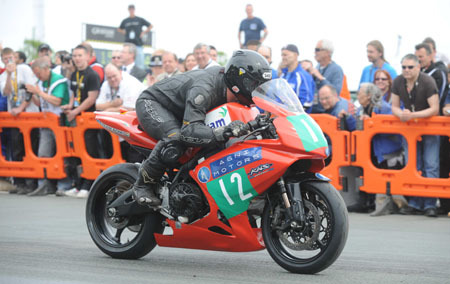 All three leccy bike championships will kick off next year, with IWC races planned to take place in Europe, the Americas and Asia as support for the 2010 Endurance World Championship and World Superbike Championship. The IWC will be run by Fédération Internationale de Motocyclisme (FIM), the governing body for motorcycle racing, and each race will be roughly 25 miles long or between ten and 12 laps of the average motorcycle GP circuit. So from a single-lap race in 2009 to 12 races on three continents in 2010, the future of e-bike racing – which many thought was doomed to failure from the outset – now looks extremely rosy. To help ensure a decent field of runners, FIM has struck a financing deal with Team Agni – which won the inaugural TTxGP – allowing potential entrants to buy a £10,000 ($16,500/€11,530) e-bike starter pack consisting of a motor, batteries, controller and electronics that can be integrated into individual chassis designs.